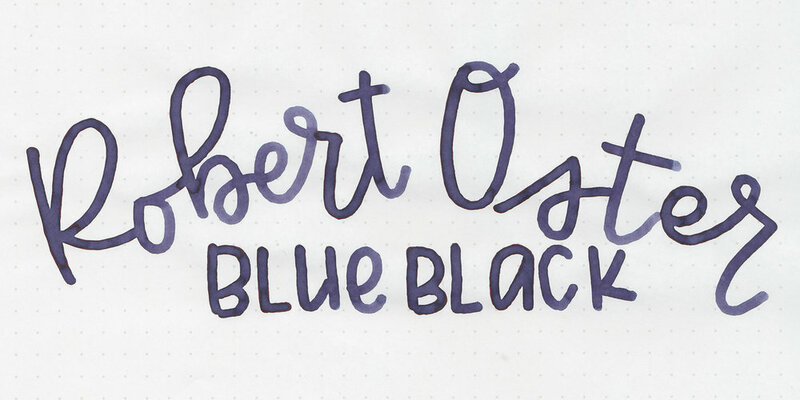 I've had some requests for Blue Black inks lately, so today's ink is Robert Oster Blue Black. I purchased my sample of ink from Vanness Pens. Blue Black is a dark blue but it does lean toward purple. It's dark enough to be professional but colorful enough to be fun. The thicker the ink is laid down the more purple it looks. The ink drops show off the lovely coppery sheen. On 20 pound copy paper the ink behaved rather well, but it did have some feathering. Ink swabs for comparison, left to right (top to bottom for mobile RSS): Diamine Blue/Black, Robert Oster Blue Black, and Robert Oster Black Violet. 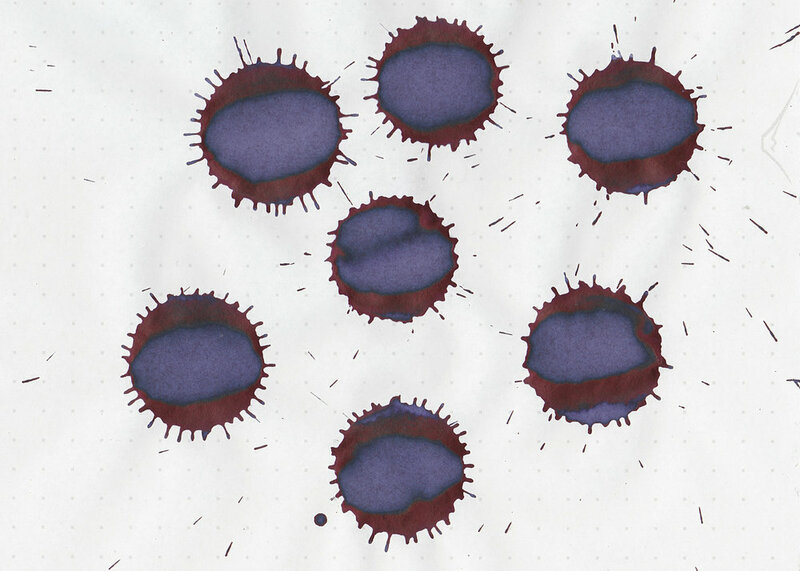 Click here to see the Robert Oster inks together, and click here to see the blue black inks together. RO Blue Black in large swabs does look closer to purple, and in writing more blue black. This is only the second blue black ink I've reviewed so far, so I don't know if it is unusual for most blue blacks to lean purple or if it's only this one. I used a broad Pelikan M805 Ocean Swirl on Tomoe River paper. The ink had an average to slightly wet flow. Even in this large wet nib the ink didn't show any sheen. Overall, the ink is a dark well behaved ink, and it would be professional enough to use at work. It is more purple than I think most blue blacks are, but I kinda dig it.